Our Signature® Carriage Collection garage doors give your home the enticing classic swing-open look and craftsmanship of a carriage house wood door, while still providing you the convenience of a standard sectional door. We brought expert Amish skill to our proven technical expertise to create a garage door with a superior level of both artistry and durability. This series comes in 16 standard designs available for paint or stain, though custom designs are also available for you. Parson: Classic designs. Simple and sophisticated, these bring the essence of luxury to your facade. Ponderosa: Conjure the spirit of American charm. With arresting lines, these feature rich details and rugged character. Villa Madre: Bringing the style of old work estates to modern architecrure. The romantic lines and distinguished flare typify elegance and style. 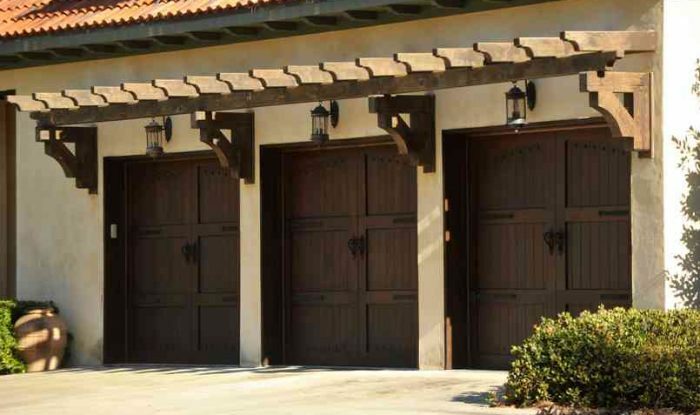 Signature Carriage® garage doors are provided in unfinished, paint-grade, or stain-grade wood. Bring distinct and detailed look of carriage house wood doors. Choose from a wide range of stunning options. Trust the impeccable Amish craftsmanship. Windows are available with a variety of trim designs. You can also select either non-insulated glass or insulated glass for maximum energy efficiency.